SYRIA / IRAN – PEACE MOVEMENT MUST DRAW IT’S OWN RED LINE! June 20, 2013, filed under PETITION, SYRIA; No Comments. January 10, 2009, filed under Vigil For Gaza; No Comments. 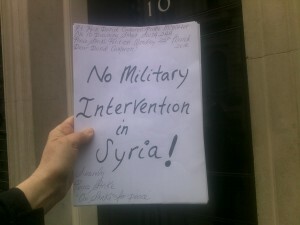 On the 16th day of her hunger strike, Maria demonstrated at No.10 Downing Street for over 2 hours as Ministers came for the Cabinet meeting and left again. Watch a film of Maria as she prepares to take her protest to the Prime Minister. On the whole Maria has received very little interest from the press for her courageous action but she was able to contribute to the call for the BBC and Sky to broadcast the appeal for Gaza – see here.